Ok children. Let me tell you a story. A long, long time ago, there was a contest where a user seemingly printed out the source image several times, clipped the copies to a line, photographed it, and then claimed it was pure chopping ability. I'm no rocket scientist, but he did not manage to hoodwink me as he did several other choppers. Take time to examine his entry and see what I am talking about. 1. He offers no psd file to back up his claim. 2. His tutorial final comes nowhere near the 'deftly executed' entry. 3. The reference to the clips as a source is laughable. 4. Duh on the bg- he just took another pic of his blank wall with the blue green wallpaper. 5. He's a photographer, yet claims he sold his only camera the week of the contest. 6. This photographer who just sold his digital camera also claims not to own a color printer. Thou do'st protest to much. 7. 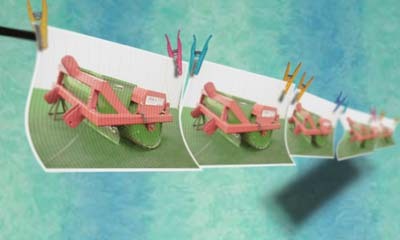 A photographer WOULD own clips and line to hang pics to dry. Also, take a look at the body of his work for comparison sake. I am only posting this because the spirit of the tutorial isn't in keeping with REAL tutorials like ReyRey's and really should be removed. Anyone have thoughts on this or care to dispute my obsevations? I'm more shocked that the guy actually went through all that trouble to attempt to recreate the photograph in a creative cover-up that involved graphs, lighting references, and examples of depth-of-field. Thanks for the laugh. The comments in his entry are almost as entertaining as chicken's famous Source Only entry. 42 people voted for it, and it was 7 years ago ffs ! this "tutorial" is a disgrace, it's years i've been saying it and on several occasions i've asked for this sham to be removed! This thread makes me chuckle. Haha! indeed no rocket science to see that it is a complete hoax! But fun to read all the comments and the way he tries to defend him self...for crying out loud he even made a tutorial haha ...probably all in all this entry took him more time to do than all of his other chops he did. I say let's put that tutorial in the 'Tutorial box of shame' section! Why not have someone with actual skills simply re-do the tutorial and show how to recreate the offending photo? you mean step by step printing the image 5 times then the hanging of the prints then take a photo of it? I'd have forgiven if he just manned up and said - "Yup, I printed em and snapped a pic. So f*ing what?" hmmmm...blurk, is that your alias?